The soil-borne fungal pathogen Verticillium dahliae Kleb causes Verticillium wilt in a wide range of crops including cotton (Gossypium hirsutum). To date, most upland cotton varieties are susceptible to V. dahliae and the breeding for cotton varieties with the resistance to Verticillium wilt has not been successful. Hpa1Xoo is a harpin protein from Xanthomonas oryzae pv. oryzae which induces the hypersensitive cell death in plants. When hpa1 Xoo was transformed into the susceptible cotton line Z35 through Agrobacterium-mediated transformation, the transgenic cotton line (T-34) with an improved resistance to Verticillium dahliae was obtained. Cells of the transgenic T-34, when mixed with the conidia suspension of V. dahliae, had a higher tolerance to V. dahliae compared to cells of untransformed Z35. Cells of T-34 were more viable 12 h after mixing with V. dahliae conidia suspension. Immunocytological analysis showed that Hpa1Xoo, expressed in T-34, accumulated as clustered particles along the cell walls of T-34. In response to the infection caused by V. dahliae, the microscopic cell death and the generation of reactive oxygen intermediates were observed in leaves of T-34 and these responses were absent in leaves of Z35 inoculated with V. dahliae. Quantitative RT-PCR analysis indicated that five defense-related genes, ghAOX1, hin1, npr1, ghdhg-OMT, and hsr203J, were up-regulated in T-34 inoculated with V. dahliae. The up-regulations of these defense-relate genes were not observed or in a less extent in leaves of Z-35 after the inoculation. Hpa1Xoo accumulates along the cell walls of the transgenic T-34, where it triggers the generation of H2O2 as an endogenous elicitor. T-34 is thus in a primed state, ready to protect the host from the pathogen. The results of this study suggest that the transformation of cotton with hpa1 Xoo could be an effective approach for the development of cotton varieties with the improved resistance against soil-borne pathogens. The soil-borne fungal pathogen Verticillium dahliae Kleb causes Verticillium wilt in a wide range of crops including cotton (Gossypium hirsutum). V. dahliae can be found in many cotton-growing areas and it has been considered as a major threat to the cotton production worldwide . The reduction of cotton biomass caused by Verticillium wilt is mainly due to the discoloration of cotton leaves and stems vascular bundles, decreased photosynthesis, and increased respiration [2, 3]. V. dahliae infects cotton roots and then grows into the host vascular system. Symptoms caused by V. dahliae in cotton include the necrosis on leaves, wilting, and the discoloration of vascular tissues. Plants infected with V. dahliae often develop characteristic mosaic patterns (leaves wilt with inter-veinal yellowing before becoming necrotic) . Light to dark brown vascular discoloration is common in stems and branches of the infected cotton. Pathogenesis of V. dahliae is complicated due to the existence of defoliating and non-defoliating strains. The defoliating strains are the most virulent, which can cause typical symptoms of Verticillium wilt and lead to the complete defoliation of infected plants . Cotton cultivars resistant to Verticillium wilt often show decreases in the rate of the disease progress and the symptom severity with a lower percentage of foliar symptoms Verticillium wilt in cotton is usually controlled by cultural practices, such as the crop rotation , biological control with organic amendments , and fungicides . Although the crop rotation and the application of organic amendments can be successfully in managing Verticillium wilt, these methods are not always practical . Chemical fungicides are not environment-friendly and tend to raise concerns about the public health and the development of fungicide resistance in pathogens . Moreover, none of the available commercial upland cotton varieties is immune to V. dahliae . Conventional breeding methods for cotton varieties resistant to Verticillium wilt have not been successful. Genetic engineering utilizing plant genes conferring disease resistance offers an alternative to conventional breeding methods for the improved resistance against pathogens, insects, or herbicides . Genes encoding antifungal proteins, such as endochitinase , β-1,3-glucanases , and glucose oxidase , or components of signaling pathways involved in the defense response [14–17], have been used to generate transgenic plants resistant to various plant pathogens. Several attempts have been made to generate transgenic cottons with a higher tolerance to Verticillium wilt. For example, a bean chitinase gene was transformed into cotton and crude leaf extracts from the transgenic cotton lines inhibited the growth of V. dahliae in vitro . Furthermore, the transgenic cotton line with an over-expressed foreign Gastrodia anti-fungal protein was more resistant to Verticillum wilt than the untransformed cotton . Harpins, encoded by hrp (hypersensitive response and pathogenicity) genes from Gram-negative plant pathogenic bacteria, are secreted through the Type III protein secretion systems (T3SSs) . The T3SSs inject effector proteins directly into the cytosol of eukaryotic cells and allow the manipulation of host cellular activities to the benefit of the pathogen. In plant pathogenic bacteria, T3SSs are encoded by hrp (for hypersensitive response and pathogenicity) genes, which are capable of inducing host defense responses mediated by different signaling pathways, such as salicylic acid (SA) , jasmonic acid (JA) , and ethylene mediated pathways . HarpinXoo is a harpin-like protein encoded by hpa1 Xoo derived from Xanthomonas oryzae pv. oryzae (Xoo), which belongs to hpa (hrp-associated) gene family related to the pathogenicity of Xanthomonas and the induction of hypersensitive response (HR) in non-host plants [23–27]. Hpa1 Xoo encodes a 13.69 kDa glycine-rich protein with an amino acid composition similar to harpins from Pseudomonas syringae  and Erwinia species . Hpa1Xoo also shares a high sequence similarity to PopA, a harpin-like protein, from Ralstonia solanacearum . It has been proposed that Hpa could be involved in the secretion of Type III-dependent proteins. HpaA from X. campestris pv. vesicatoria promotes the secretion of pilus and effector proteins and therefore appears to be an important control protein of the T3SSs . We had shown previously that the transformation of hpa1 Xoo into tobacco conferred the improved resistance to Alternaria alternata and tobacco mosaic virus in the transgenic tobacco . Similarly, a high level of resistance to all predominant races of Magnaporthe grisea in China was obtained in the rice line transformed with hpa1 Xoo from Xanthomonas oryzae pv. oryzae . Several other hrp genes have also been successfully transformed into different plant species including tobacco [32, 34], potato , rice , and pear . Unfortunately, the defense responses elicited by harpins and their active sites in hosts have not been fully understood. In this study, a cotton transgenic line resistant to a range of soil-borne pathogens, including V. dahliae, was generated through the genetic transformation with hpa1 Xoo from Xoo. The localization of hpa1Xoo in the transgenic cotton line was investigated. Furthermore the defense response and the expressions of defense-related genes in hpa1 Xoo -expressing cotton line in response to V. dahliae were investigated. Thirty transgenic T-34 plants and 5 untransformed Z35 plants were tested annually from 2003 to 2008. From T1 toT6, the transgenic cotton lines were screened for the resistance to kanamycin, the presence of hpa1 Xoo insertion, and the expression of harpinXoo. Only plants tested positive for these three attributes and showed an improved resistance to Verticillium wilt were selected and used for the further screening (see Additional file 1: Table S1). Resistance in the T6 progeny of T-34 line to V. dahliae segregated in a 3:1 ratio as a single Mendelian trait. Four plants from T-34 line (T6 progeny) were randomly selected and used in the PCR analysis. Bands representing hpa1 Xoo , 35S promoter, and NOS terminator (420 bp, 310 bp, and 180 bp, respectively) were detected in all four T-34 plants but they were absent in wild type Z35 plants (Figure 1a, b). Results of the PCR analysis were verified by the sequencing of amplification products and BLAST against appropriate sequences in the NCBI database http://www.ncbi.nlm.nih.gov (data not shown). The presence of hpa1 Xoo inserts in transgenic plants was confirmed using Southern blot analysis against a DIG-labeled hpa1 Xoo probe. Three bands, approximately 4.5 kb, 6.5 kb, and 10.5 kb in length, were detected using the DIG-labeled hpa1 Xoo probe in the genomic DNA extracted from the four chosen T-34 plants. No positive signal was detected in untransformed Z35 (Figure 1c). The expression of harpinXoo in cotton leaves was analyzed using a harpinXoo polyclonal antibody. The band representing harpinXoo was observed only in the total proteins extracted from leaves of hpa1 Xoo -transformed T-34 (Figure 1d). All these results indicated that hpa1 Xoo had been successfully transformed into T-34 and hpa1Xoo was constitutively expressed in the transgenic line T-34. Molecular analysis of hpa1 Xoo -transformed T-34 and untransformed cotton. (Gossypium hirsutum)Z35. (a) The schematic representation of recombinant plasmid pBI35S-hpa1 Xoo -nptII. R and L represent the right and left borders of T-DNA. (b) Amplifications of hpa1 Xoo (1), 35S promoter (2), and NOS terminator (3) in PCR; hpa1 Xoo (h), 35S promoter (35S), and NOS terminator (NOS) represented the DNA fragment amplified from the positive control. M: marker; Four individual plants (1, 2, 3, 4) in T6 progeny of T-34 were tested. (c) Southern blot analysis of hrp1 Xoo insertions in T-34 and Z35. Ten micrograms of genomic DNA was digested with EcoRI and hybridized against a DIG-labeled hpa1 Xoo probe. M: marker. Four plants (1, 2, 3, 4) in T6 progeny of T-34 were tested. 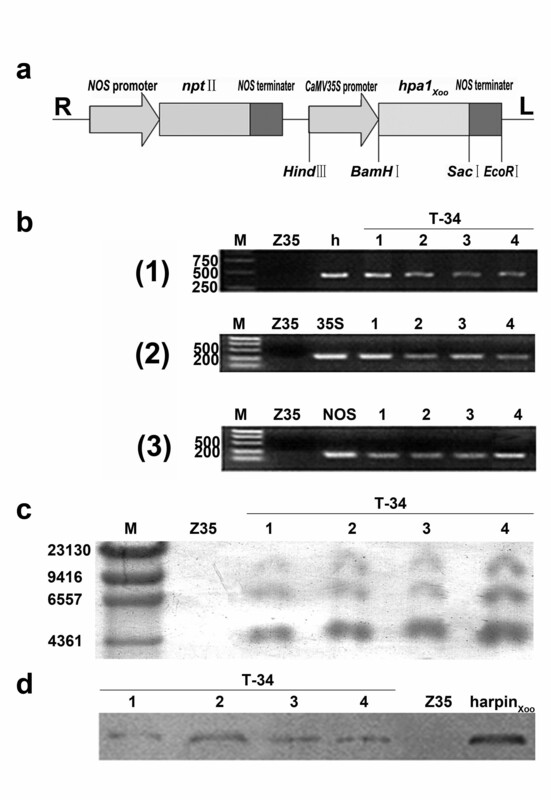 (d) Western blot analysis of harpinXoo in T-34 transgenic lines. Four plants (1, 2, 3, 4) in T6 progeny of T-34 were tested. Purified harpinXoo served as the positive control. The typical symptoms of Verticillium wilt first appeared on plants 10 days after the inoculation, and symptoms develop only when the temperature is below 30°C . In our study, Verticillium wilt resistance of 45 hpa1 Xoo -transformed T-34 plants inoculated with V. dahliae strains Vdps and V151 was assessed 10 days after the inoculation based on the degree of the foliar damage and vascular discoloration as described in the material and method. All plants were individually scored. The susceptible variety, Simian 3, and untransformed Z35 were used as the control. Ten days after the inoculation, only few chlorotic and necrotic spots were visible on leaves of T-34 whereas large chlorotic and necrotic areas were common in leaves of untransformed Z35 and the susceptible line Simian 3 (pictures not shown). The resistance of T-34 to Verticillium wilt was evaluated in field in 2008. A total of 200 plants were scored. The characteristic mosaic pattern of Verticillium wilt was rare in leaves of T-34 and no defoliation occurred during the growing season. In comparison, most Z35 plants showed severe Verticillium infections with the characteristic mosaic pattern on leaves and the defoliation occurred 2 or 3 months after the inoculation (Figure 2a). Resistance of hpa1 Xoo -transformed T-34 and untransformed Z35 to Verticillium wilt. (a) Resistance phenotypes of hpa1 Xoo -transformed T-34 and untransformed Z35 to Verticillium wilt in the nursery. (b) Disease severity of Verticillium wilt on hpa1 Xoo -transformed T-34 and untransformed Z35 in the nursery. (c) Disease severity of Verticillium wilt on hpa1 Xoo -transformed T-34 and untransformed Z35 in plastic pots. Average values and standard errors were calculated from 4 replicates. Simian 3 was the susceptible control. Asterisks represent significant differences at the level of 0.01. The maximum temperature reached 32°C on August 5, 2008 and typical Verticillium symptoms were no longer visible. Disease assessment made from 22 June to 5 August showed that Verticillium wilt was significantly less severe in hpa1 Xoo -transformed T-34, compared to untransformed Z35 and the susceptible variety Simian 3 (Figure 2b). The average Verticillium wilt ratings in hpa1 Xoo -transformed T-34 were 7.32%-26.22% lower than those in untransformed Z35. 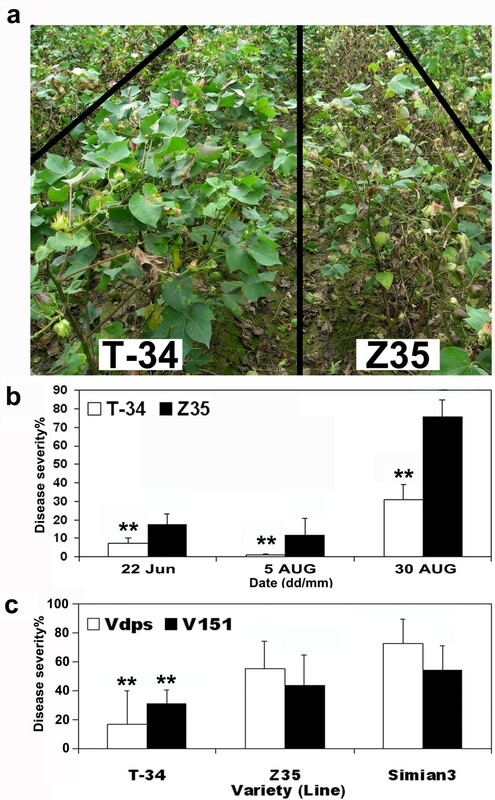 Although the defoliating strain V151 was more virulent than the non-defoliating strain Vdps  on T-34, the disease severity caused by these two stains were both lower on T-34, compared to the untransformed Z35 and the susceptible control Simian 3 (Figure 2c). The transgenic T-34 and untransformed Z35 line shared similar phenotypic characteristics including the leaf morphology, and fiber quality (data not shown). Although the height of T-34 line was lower before the flowering stage, there was no significant difference between the height of T-34 and Z35 at and after the flowering stage (see Additional file 2: Figure S1). The localization of harpinXoo in tissues of hpa1 Xoo -transformed T-34 was investigated using the immuno-gold localization method. The harpin Xoo -labeled gold particles were not found in leaf and stem samples collected from the untransformed Z35 (Figure 3c and 3f) but they were clearly visible in leaf and stem samples from T-34 (Figure 3b and 3e). HarpinXoo-labeled gold particles were mostly seen in clusters along the cell walls of leaves and in apical tissue of stems (Figure 3b and 3e). Each cluster contained an average of 10 to 20 gold particles. Only a few gold particles were found in cell membranes and chloroplasts. None was found in the mitochondria (Figure 3c). Immuno-gold localization of harpin Xoo in leaves and stem apices of hpa1 Xoo -transformed T-34 and untransformed Z35. (a) and (b) Stem apices of hpa1 Xoo -transformed T-34. (c) Stem apices of untransformed Z35. (d) and (e) Leaves of hpa1 Xoo -transformed T-34. (f) Leaves of untransformed Z35. CW: cell wall, Cy: cytoplasm, V: vacuole, IS: intercellular space, Ch: chloroplasts, M: mitochondria. Bars: a and d = 5 μm; b, c, e, and f = 0.2 μm. Arrow points to gold particles labeled with harpinXoo antiserum (15 nm particles). The squares indicate the regions of b and e magnified in a and d, respectively. More than 20 ultrathin sections of each sample were examined with a JEM × 1200 transmission electron microscope (Nikon, Japan). The experiment was repeated twice. 3, 3'-diaminobenzidine tetrahydrochloride (DAB) was used to detect the production of reactive oxygen intermediates (ROI) . No reddish or brown spots representing the accumulation of H2O2 were observed in T-34 and Z35 leaves dipped in water. After the inoculation, visible reddish or brown spots were only observed in T-34 leaves collected 3 h after dipping in the conidial suspension of V. dahliae (Figure 4a, b). H2O2 content in T-34 and Z35 leaves dipped in the conidial suspension of V. dahliae was quantified using the method described by Jiang and Zhang (2001). The basal level of H2O2 was higher in leaves of transgenic T-34 than in leaves of Z35 prior to dipping. The level of H2O2 increased dramatically in leaves of transgenic T-34 3 h after dipping and such increase in H2O2 content was not observed in the treated Z35 leaves (Figure 4c). Generation of active oxygen species (AOS) in leaves of hpa1 Xoo -transformed T-34 and untransformed Z35. (a) Oxygen burst in cotton leaves dipped in the conidial suspension of Verticillium dahliae collected from 0 to 3 hr after inoculation (red arrow points to the location of oxygen burst). (b) Light microscopy of the oxygen burst in leaves of untransformed Z35 (1) and hpa1 Xoo -transformed T-34 (2) 3 h after the inoculation. (c) H2O2 content (μg/g fresh weight) in leaves of hpa1 Xoo -transformed T-34 and untransformed Z35 dipped in the conidial suspension of V. dahliae (mean values and standard errors calculated from three replicates). 1, non-inoculated; 2, inoculated. (d) Quantitative RT-PCR analysis of ghAOX1, hin1, npr1, ghdhg-OMT, and hsr203J expression in leaves of hpa1 Xoo -transformed T-34 (T-34-i) and untransformed Z35 (Z35-i) dipped in the conidial suspension of V. dahliae compared with that of hpa1 Xoo -transformed T-34 (T-34) and untransformed Z35 (Z35) dipped in water (error bars indicate standard error). b (1, 2) scale bars = 0.01 mm. The experiment was repeated three times. Asterisks represent significant differences at the level of 0.01. The expressions of ghAOX1 [GenBank accession number DQ250028], hsr203J [GenBank accession number X77136], hin1 [GenBank accession number Y07563], and npr1  were quantified using the real-time RT-PCR. GhAOX1 is a key gene involved in the production of active oxygen species (AOS) in plants [40, 41] and hsr203J and hin1 are marker genes for HR which express specifically in plant tissues undergoing HRs [42, 43]. The data was normalized to a constitutive expressed ef-1α. No up-regulations of npr1, hsr203J, hin1 and ghdhg-OMT were observed in the un-inoculated T-34 and Z-35 plants. The basal expression level of GhAOX1 was higher in the un-inoculated T-34, compared to that in wild type Z35. Npr1, hsr203J, hin1 and GhAOX1 were all up-regulated in T-34 and Z35 after plants were dipped in the conidial suspension of V. dahliae. Nevertheless, the up-regulations of these genes were stronger in leaves of transgenic T-34 in response to the dipping treatment (Figure 4d). In addition, the up-regulation of dhg-OMT  encoding hemigosspol was only observed in T-34 after the dipping treatment (Figure 4d). Leaves were collected from T-34 and Z35 20 days after the root inoculation with V. dahliae conidia suspension in the green house and then stained with Trypan blue, which selectively stained dead or dying cells. Leaves inoculated with sterile water were used as the control. The results of microscopic examination were shown in Figure 5. 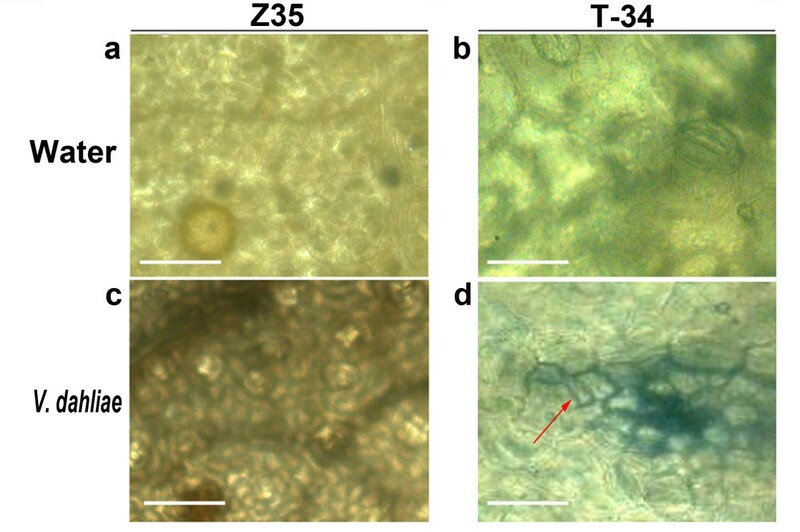 No Trypan blue stained cells were observed in leaves of T-34 and Z35 treated with water (Figure 5a, b) and in leaves of Z35 inoculated with V. dahliae (Figure 5c). In comparison, large regions (1 to 5 μm2) of Trypan blue stained cells were observed in leaves of T-34 inoculated with V. dahliae indicating the occurrence of microscopic hypersensitive response (HR) (Figure 5d). The occurrence of regions of Tyrpan blue stained cells representing micro HRs (10-20 lesions per leaves) was observed in all leaves (≥ 4 leaves per plant) collected from 10 T-34 plants infected with V. dahliae (100%) whereas it was not observed in the controls (T-34 and Z35 un-inoculated) (0%). Microscopic hypersensitive response (HR) in hpa1 Xoo -transformed T-34 and untransformed Z35 20 days after root inoculations with Verticillium dahliae. (a) Leaves of uninoculated untransformed Z35. (b) Leaves of uninoculated hpa1 Xoo -transformed T-34. (c) Leaves of untransformed Z35 inoculated with V. dahliae. (d) Leaves of hpa1 Xoo -transformed T-34 inoculated with V. dahliae (red arrow indicates microscopic HR). (a), (b), (c), and (d) scale bars = 1 μm. The experiment was repeated three times. To determine the reaction of harpin Xoo -transformed cotton cells to V. dahliae, cell suspensions of harpin Xoo -transformed T-34 and untransformed Z35 were mixed with the conidial suspension of V. dahliae in a ratio of 1: 20 by volume. The viability of cotton cells was counted at 3, 6, 9, and 12 h after mixing with V. dahliae conidial suspension under a fluorescence microscope by staining with fluorescein diacetate (FDA). Fluorescence emitted from T-34 cells was stronger than that from Z35 cells (Figure 6a). The percentage of cell death in T-34 cell suspension mixed with V. dahliae conidia was significantly lower than that in Z35 cell suspension mixed with V. dahliae from 3 to 12 h (Figure 6b). The viability of Z35 and T34 cells was similar in the absence of V. dahliae conidia and almost 100% of untreated Z35 and T34 cells were viable after 12 h (Figure 6c). Viability of cotton cells in the presence of conidia of Verticillium dahliae. (a) (1) Living (red arrow) or dead (white arrow) cells in the cell suspension of untransformed Z35 mixed with conidia of V. dahliae under a conventional light microscope. (2) Living (red arrow) or dead (white arrow) cells in the cell suspension of hpa1 Xoo -transformed T-34 mixed with conidia of V. dahliae under a conventional light microscope. (3) Fluorescence emitted from living cells (red arrow) of untransformed Z35 mixed with conidia of V. dahliae under a fluorescence microscope. (4) Fluorescence emitted from living cells (red arrow) of hpa1 Xoo -transformed T-34 mixed with conidia of V. dahliae under a fluorescence microscope. (1), (2), (3), and (4) scale bars = 300 μm. (b) Percentage of the cell death in the cotton cell suspension mixed with V. dahliae conidia. (c) Percentage of cotton cells in the absence of conidia of Verticillium dahliae. Cotton cells and V. dahliae conidia were mixed in a ratio of 1:20. The percentage of cell death was counted at 3, 6, 9, and 12 h after mixing. Error bars indicate standard error of the mean (n = 3). Data points marked with asterisks are significantly different (Student's t test, p < 0.01). The experiment was repeated three times. In our previous study, we reported that harpinXoo, applied as a foliar spray, conferred cotton the resistance to Verticillium wilt in a Verticillium cotton nursery . In this study, hpa1 Xoo was transformed into a susceptible upland cotton variety Z35. During the screening process, the hpa1 Xoo -transformed cotton lines were more resistant not only to Verticillium wilt but also to Fusarium wilt caused by Fusarium oxysporum f. sp. vasinfectum (see Additional file 3: Figure S2). The non-specific resistance is often related to the up-regulation of npr1. NPR1 is thought to be a key transcriptional regulator in plant defense responses involving multiple signaling pathways . In this study, the up-regulation of npr1 was observed in hpa1 Xoo transformed T-34 after the inoculation with V. dahliae. This could indicate that the improved resistance in cotton mediated by the transformation of hpa1 Xoo is likely to be non-specific. In addition, cells of the transformed T-34 plants were more tolerant to V. dahliae, compared to cells of Z35, when they were cultured with V. dahliae conidia suspension (Figure 6). It is possible that the improved resistance in hpa1 Xoo -transformed cotton plants is also related to the improved tolerance of cotton cells to V. dahliae. It should be noted that the hpa1 Xoo -transformed cotton was not entirely immune to V. dahliae under our test condition. Similarly several harpin expressing transgenic plants only showed enhanced, but not complete, resistance to a wide range of pathogens [32–34]. Since harpins often act as effectors which induce systemic acquired resistance rather than the immunity in plants, these results are not surprising. Secondly, Z35 is a very susceptible variety. The highly virulent, defoliating strains were dominant in the area where transgenic plants were tested. The inoculum level of V. dahliae in the region was extremely high due to the recent Verticillum wilt outbreak . It is possible that the incomplete resistance of hpa1 Xoo -transformed cotton against V. dahliae is partially due to the high level of inoculum and the aggressive V. dahliae pathotype in the region . To date, the action site of harpins in plants remains unknown. An early study of harpinEa and harpinPss indicated that the plant cell wall was critical for HR inducing activity of harpinEa and harpinPss . Tampakaki and Panopoulos  suggested that the receptor(s) for harpin could be extracellular in transgenic tobacco transformed with hrpZPsph. More recently, immuno-cytological analyses showed that HR phenotype of transgenic tobacco was related to the presence of PopA at the plasma membrane, which was involved in the formation of an ion-conducting channel allowing the passage of true effectors into plant cells [49, 50]. This discrepancy indicates that the binding sites of harpins in plants vary depending on their origins. 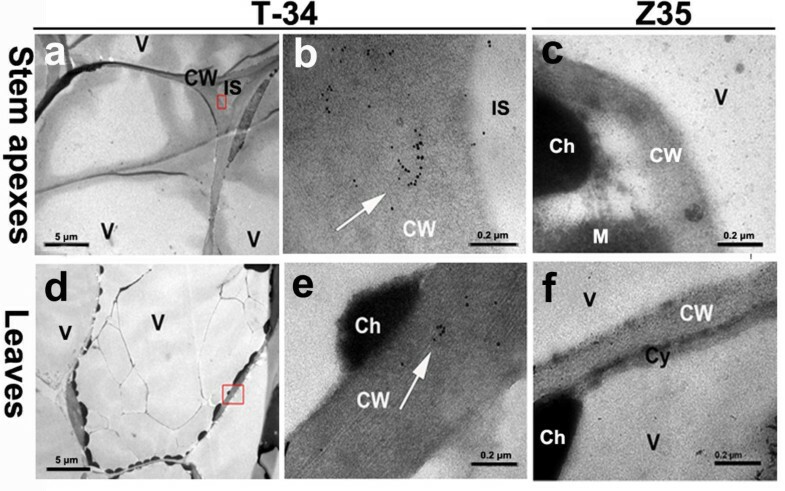 In our study, harpin Xoo was detected as clustered particles mainly along the cell walls of transformed T-34. This result was in an agreement with that reported by Hoyos et al. and indicated that the cotton cell wall could be important for the HR inducing activity of harpin Xoo in the transgenic cotton. Similarly, Sohn et al. (2007)  reported that the action site of harpins located in the plant cell walls. It remains not clear that how Harpins were secreted to cotton cell walls in the transgenic plants since the signal peptide was not included in harpin Xoo used for the trasnformation. Similarly, several previous studies showed that transformation of harpin-encoding genes without known signal peptides into rice and tobacco resulted in the in vivo expression of harpins, which conferred the improved resistance against different pathogens [32–34]. The secretion of Harpins to the plant cell wall in the harpin Xoo transformed cotton suggests the presence of unknown signal peptide in harpin Xoo which is recognized by cotton. It is also possible that harpin Xoo may utilize the plant signal peptide during its in vivo expression. Although the even distribution of immuno-gold labeled particle is normal in the immunocytological study [51–53], the distribution of immuno-gold particles in clusters is not uncommon [54, 55]. It has been reported that the defense responses induced by harpins were different between the endogenous and exogenous applications. For example, visible HRs, accompanied by the up-regulation of HR marker genes, often occur in tobacco leaves infiltrated with Harpins . Only microscopic HRs can be observed when Harpin is sprayed onto leaves despite the similar up-regulation of HR marker genes in treated plants . In transgenic plants expressing Harpin, the defense responses are more complicated in response to the pathogen infection. The transgenic plants show a stronger response to the pathogen infection resulting from the substantial increase in the expression of the defense related genes, such as the marker genes for HR and SAR and those encoding anti-microbial proteins [32–34]. The defense response and transcriptional expression of multi-defense genes were significantly enhanced in the harpin Xoo transformed T-34 compared to that seen in untransformed Z35. In addition, we also compared the transcriptional difference in a genomic wide analysis between hpa1 Xoo -transformed T-34 and untransformed Z35 through microarray analysis in which over 1000 genes involved in 162 pathways were found to be regulated differently (unpublished data). These results suggest an altered regulation of genes involved not only in the disease resistance but also in many metabolic pathways in the harpin Xoo transformed plants. This unique physiological condition is very similar to the so-called primed state . The primed plants often display faster and/or stronger activation of cellular defenses to various stresses and depend on the key regulator of induced resistance, namely npr1. Over the past decade, the priming of defensive responses in plants by pathogen-associated molecular patterns (PAMP; elicitor) triggered by plant pathogens has been increasingly evident [57–60]. In our study, npr1 was slightly more up-regulated in the transgenic T-34 compared to that in wild type Z35 in response to V. dahliae. Similarly the up-regulation of npr1 was also observed in the transgenic hpa1 Xoo tobacco but it was not found in the transgenic hpaGEP tobacco in response to the pathogen infection [32, 34]. This difference in the expression of npr-1 in different transgenic plants expressing Harpins could be due to the differences either in the receptor of the target gene or in the sites of their insertions in the plant genome. In leaves of transgenic T-34, micro HR occurred in response to the inoculation of V. dahliae. In addition, the more rapid accumulation of H2O2 and up-regulation of ghAOX1 and hsr203J were observed in T-34, compare to those in wild type Z35, after the inoculation. Harpin can induce HR which is associated with the generation of reactive oxygen intermediates as a proximal response. A rapid burst of reactive oxygen species (ROS) followed by a chain of events often occur in plants treated with harpins [21, 56]. It is still questionable whether the micro HR observed in the transgenic T-34 is directly related to the infection caused by V. dahliae since no V. dahliae was observed in the sites of micro HRs. It is possible that such micro HR could augment the defense response in the transformed T-34 by the gentle PCD (programmed cell death) correlated with the enhanced expression of HR marker genes. Micro HR could contribute to the resistance against Verticillium wilt through a priming mechanism. The primed state also explains the higher basal levels of H2O2 in leaves of the transgenic line (T-34). Dhg-OMT was also up-regulated in T-34 after inoculations with V. dahliae. Since dhg-OMT encodes one key enzyme in the biosynthesis of terpenoids in cotton. It indicates that the phytoalexin-like compound may be also involved in the defense response of cotton against V. dahliae . Hpa1Xoo accumulates along the cell walls of the transgenic T34, where it could trigger the generation of H2O2 as a cell wall endogenous elicitor. T-34 is thus in a primed state, ready to protect the hosts from pathogens. Multiple defense responses are induced in the transgenic T-34 in response to the infection caused by V. dahliae. Hin1 (ndr1) and hsr203j are up-regulated in T-34 indicating that the genes related to HR are activated without any visible HR phenotype in the transgenic plants. 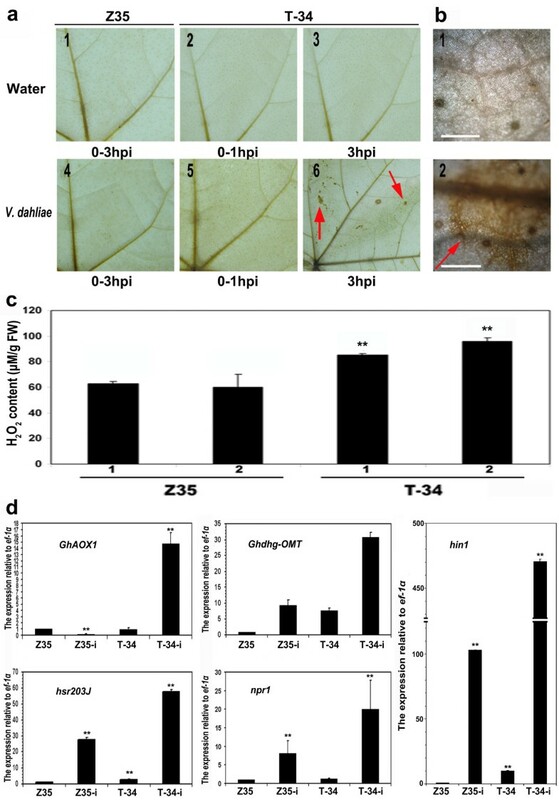 ZhongMian 35 (Z35) (Gossypium hirsutum L.) was used to generate transgenic cotton lines expressing harpin Xoo using an Agrobacterium tumefaciens-mediated method described by Shao et al. (2008) . A pGEM-T vector containing hpa1 Xoo (pGEM-hpa1 Xoo ) was digested with BamH1 and Sac1. The BamH1- and Sac1-digested hpa1 Xoo fragment was ligated into a pBI121 vector (Clontech, Palo Alto, CA, USA) to generate the recombinant binary vector pBI35S-hpa1 Xoo -nptII, which contained a neomycin phosphotransferase II (nptII) with a nopaline synthase (nos) promoter and terminator, a CaMV35S promoter, an hpa1 Xoo insert, and a nopaline synthase terminator (Figure 1a). The binary vector pBI35S-hpa1 Xoo -nptII was mobilized into Agrobacterium tumefaciens-disarmed helper strain LBA4404 by the heat shock method . Hypocotyl segments of Z35 were used as explants for the transformation, and the transformants were selected using the method described by Sunilkumar and Rathore (2001) . Kanamycin resistance tests, PCR analysis, and Southern and Western Blot were used to screen T1 to T6 progeny for transgenic harpin Xoo cotton lines with desirable phenotypes including improved resistance to Verticillium wilt and fiber quality. Only T6 progeny from transgenic line T-34 were used in this study and untransformed Z35 (receptor) was used as the negative control. Cultivated cotton cultivar Simian 3 was used as the susceptible control for evaluating resistance to Verticillium wilt in the study. A non-defoliating V. dahliae strain Vdps and a defoliating V. dahliae strain V151, obtained from Dr. Ling Lin at the Jiangsu Academy of Agricultural Science (China), were used in our the study. V. dahliae strains were maintained on potato dextrose agar (PDA) at 25°C. For the preparation of the inoculum, PDA plates were flooded with a conidial suspension of V. dahliae and the flooded plates were incubated at 25°C for 7 days. The PDA plates were then flooded with 50 ml sterile distilled water to collect the conidia using the method described by Joost et al. (1995) . The conidia were washed once with 100 ml sterile distilled water and the suspension was diluted to a concentration of 1-3 × 107 conidia/ml. The conidial suspension of V. dahliae strain Vdps was used to inoculate the roots of cotton plants and for other experiments. After the surface disinfection for 5 min with a 5% solution of sodium hypochlorite, cotton seeds were sown in a potting mixture (mould and sand, 6:1, v/v). Fifteen 2-week-old cotton seedlings were carefully uprooted and the roots were immersed for 15 min in 100 ml of conidial suspension containing 1-3 × 107 conidia per ml. Fifteen control plants were immersed in sterile distilled water. All plants were then replanted in a plastic pot (9 cm in diameter) and grown under 12 h of light at 25°C and 70%-90% relative humidity. Pathogenicity was determined based on both external (foliar damage) and internal (vascular discoloration) symptoms 10 and 20 days after inoculation, respectively. Foliar damage was evaluated by rating the symptom on the cotyledon and leaf of inoculated plant (X) according to the following rating scale: 0 = no foliar symptoms; 1 = yellowing or necrosis of 1-2 cotyledons; 2 = cotyledon fall or yellowing of a leaf; 3 = more than 2 wilted or necrotic leaves; 4 = dead leaf. Foliar alteration index (FAI) was calculated for each inoculated plant: FAI = 100∑X/(4n), where (4) is the maximum score for each plant (maximum score for each plant = 4), (n) the total number of inoculated plant. Vascular discoloration was evaluated according to the method described by Yang et al. (2008) ; discoloration was scored (y) for every internode using the following scale: 0 = no discoloration; 1 = less than 25% localized brown regions within the vascular tissue of the same internode; 2 = 25%-70% localized brown regions within the vascular tissue of the same internode; 3 = more than 70% browning of vessels but not of the adjacent tissues; 4 = browning of both vessels and adjacent tissues. The browning Index (BI) was calculated as follows; BI = 100∑y/4d; where (d) is the total number of seedling internodes including hypocotyls and (4) is the maximum score for an internode. Mean values of FAI and/or BI as Disease severity (DS) were calculated based on four replicates for both inoculated and control plants. In 2008, the resistance of transgenic cotton was evaluated in a naturally infested Verticillium wilt nursery in DaFeng city, Jiangsu province, China. The soil in the nursery is sandy-loam with pH of 8.5. Except for the higher temperature (>30°C) in August, average temperature at the nursery usually ranges between 20°C and 25°C during the growing season, which is conducive for the development of Verticillium wilt. Seeds of the transgenic cotton were sown in the field in early May of 2008. Irrigation was provided as needed during the growing season. The experimental plot was divided into four subplots. Each subplot consisted of two rows. Each row is 5 m long and 4 m wide and comprises 15 plants spaced 0.3 m apart. Each treatment was replicated four times, and the replicates were arranged in a randomized complete block design. Untransformed cotton Z35 served as the negative control for Verticillium wilt. The testing materials in each replicate were sown randomly in each subplot. The trial plot was separated by at least 50 m from other breeding materials of cotton and sprayed with pesticides to control insect pests. Scoring for disease severity started after the first symptoms appeared on leaves; subsequently, the scoring was conducted on 22 June, 5 August, and 30 August 2008. Seedlings were screened for kanamycin resistance (Amresco, Solon., Ohio, USA) at the 3- to 4- leaf stage. Kanamycin was applied onto the leaf surface at a concentration of 5000 mg/L. kanamycin-susceptible seedlings, which changed from green to yellow, were discarded a week after the Kanamycin treatment. The treatment was repeated three times and only kanamycin-resistant plants were retained for further study. Total genomic DNA was extracted from leaves of transgenic cotton line T-34 and the untransformed Z35, using a AxyPrep Multisource Genomic DNA Miniprep Kit (Axygen Biosciences, California, USA). Primers for hpa1 Xoo , CaMV35S promoter, and NOS terminator (listed in Table 1) were used in the PCR assays. PCR reactions were carried out in a 25 μl reaction volume containing 1× PCR buffer (Applied Biosystem), 1.5 mM MgCl2, 0.2 mM dNTPs, 2.5 mM forward and reverse primers, 0.5 U Taq polymerase, and 30 ng sample DNA. Amplifications were performed in a thermal cycler (GeneAmp PCR 9700) using the following temperature profile: initial denaturation at 95°C for 2 min; 35 cycles at 95°C for 30 s, 60°C for 30 s, and 72°C for 1 min; and a final extension at 72°C. For the Southern blot analysis, 3 μg genomic DNA extracted from leaves of the transgenic T-34 and untransformed Z35 was digested with restriction endonuclease EcoR1 (TaKaRa Biotechnology (Dalian) Co. Ltd, China) in a final volume of 50 μl. The digested genomic DNA was separated on 1.5% (w/v) agarose gel and then transferred onto a hybond- N+ nylon membrane (Roche Applied Science, Mannheim, Germany) after denaturation using the method prescribed by the manufacturer. The probe for hybridizations was amplified from an hpa1 Xoo fragment and then labeled with digoxigenin using DIG-High Prime DNA Labeling Kit (Roche Applied Science, Mannheim, Germany). The hybridization signal was detected using a DIG-High Prime DNA Detection Kit (Roche Applied Science, Mannheim, Germany). Total proteins were extracted from leaves of transgenic T-34 and untransformed Z35 according to the manufacturer's instructions for P-CelLytics Plant Cell Protein Extraction Kit (Shenergy Biocolor Bioscience and Technology Co., Shanghai, China). Total proteins were separated on a 15% sodium dodecyl sulfate-polyacrylamide gel electrophoresis (SDS-PAGE) and then transferred onto a polyvinylidene fluoride (PVDF) membrane (Roche Applied Science, Mannheim, Germany). The membranes were blotted with a polyclonal antibody developed against harpin Xoo and goat anti-rabbit IgG-HRP antibody (Sino-American Biotech, Luoyang, China). The color was developed using DAB. Samples were collected from the second and the third fresh leaves and stem apex of four T-34 and two Z35 plants at 4 to 5 leaf stage. The leaf samples were first fixed in a mixture of 3% (v/v) paraformaldehyde and 1% glutaraldehyde in 50 mmol phosphate-buffered saline (PBS), pH 7.2, at 4°C for 3 h. The samples were then washed with the same buffer and dehydrated in 50% ethanol at 4°C for 1 h, followed by washings with 50%, 70%, 90%, and 100% ethanol (3 times each) at -20°C for 2 h. Finally, the samples were embedded in K4M resin and polymerized under UV array at -20°C for 3 days and incubated at the room temperature for 2 days. Ultrathin sections were cut with a diamond knife and collected on Formvar-coated nickel grids. Colloidal gold particles, 15 nm in diameter, were prepared as described by Slot and Geuze (1985)  and coated with Protein A at pH 6.0. HarpinXoo antiserum was used for the localization of harpinXoo and the immuno-labeling was performed at 28°C. The ultrathin sections were floated on a drop of double-distilled water for 5 min; the samples were then transferred to the blocking solution (BL) and incubated for 60 min. HarpinXoo antiserum was added to the BL in a dilution of 1:200; the samples were incubated for 60 min; floated first on BL for 60 min and then on PA-gold for 120 min. The samples were thoroughly washed with double-distilled water 3 times and air-dried. More than 20 ultrathin sections of each sample were examined with a JEM ×1200 transmission electron microscope (Nikon, Japan). The experiment was repeated twice. Suspensions of Z35 and T-34 cells were prepared using the method described by Wu et al. (2005) . The cells were cultured in a 500 ml round-bottom flask containing 200 ml modified MS medium (MS; 2,4-D 0.1 mg/L, kinetin 0.1 mg/L, maltose 30 g/L; pH 5.8). The flasks were placed under illumination for 12 h with continuous shaking (120 rpm). Cells were sub-cultured weekly by a 4-fold dilution until harvest. The suspensions of cotton cells and of the conidia were then mixed in a ratio of 1:20. The final concentration of both the cells and the conidia in the mix was the same, namely 1-3 × 107 cells/mL. Death of cotton cells in the mixture was quantified using the FDA stain method described by Amano et al. (2003) . The number of viable cells emitting fluorescence was counted under a fluorescence microscope (Olympus, Japan). The percentage of dead cells was calculated as [(total cells - cells emitting fluorescence)/total cells] × 100. The experiment was repeated three times. Roots of transgenic T-34 and untransformed Z35 plants at the 2 to 3 leaf stage were inoculated with a conidial suspension of V. dahliae (1-3 × 107/ml) according to the method described above. Leaves were collected 10 days after the inoculation and stained with Trypan blue using the method described by Lipka et al. (2005) . Stained leaf samples were observed under a Leica light microscope (Leica DMRB, Leica Microsystems, Germany) and photographed with a Leica DFC camera (DM2500-3HF-FL, Leica Microsystems, Germany). Leaves (≥ 4 leaves per plant) without any wound or visible symptom of the disease from 10 independent T-34 plants were examined. The second and third cotton leaves with freshly cut petioles and no visible wounds were collected when the plants were at the 5 leaf stage. Two-third of the petiole was immersed into 10 ml of conidial suspension (1-3 × 107 ml) for 0, 1, or 3 h. To make the accumulation of H2O2 in the cotton leaves visible, fresh inoculated leaf samples were incubated in 1 mg/ml of DAB (pH 3.8) for 8 h and then decolorized in 96% ethanol. The samples were mounted on slides with 60% glycerol and examined under an Olympus light microscope (BH-2). The accumulation of H2O2 was visible as a reddish or brown discoloration. Furthermore, the production of H2O2 in leaves was quantified. Leaves dipped in sterile water were used as the negative control. The production of H2O2 in leaves was measured 0, 1, and 3 h after inoculation with a commercial H2O2 detection kit (Nanjing Jiancheng Bioengineering Institute, Nanjing, China) using the method described by Jiang and Zhang (2001)  and expressed as a percentage of fresh weight. The experiment was repeated three times. The second and third fully grown leaves of cotton were harvested when the plants were at the 5 leaf stage and inoculated as described above. Leaves treated with sterile distilled water served as control. The leaf blades were frozen in liquid nitrogen immediately after the sampling. Total RNA was extracted from the leaves using a commercial kit, namely RNAiso, from TaKaRa Biotechnology Co. Ltd, Dalian, China. RNA concentrations were quantified using a biophotometer (Eppendorf AG, Hamburg, Germany). cDNA was prepared with a TaKaRa PrimeScript RT-PCR kit (TaKaRa Biotechnology Co. Ltd, Dalian, China). Two-step qRT-PCR was performed on an ABI PRISM 7000 (ABI, Foster City, CA, USA) using a SYBR Premix EX TaqTM kit (TaKaRa Biotechnology Co. Ltd, Dalian, China). All PCR reactions were repeated three times and the data were normalized to constitutively expressed ef-1α using the 2-ΔΔCT method described by Livak and Schmittgen (2001) . The primer sequences used in the quantitative RT-PCR are listed in Table 1. For quantitative determination, the data were analyzed by the t test at P = 0.05 or 0.01 using the Microsoft Analysis Tool. For differences in disease severity, each transgenic plant was compared with an untransformed plant. Weiguo Miao, Xiben Wang, Ming Li contributed equally to this work. This work was supported by grants from National Key Basic Research Plan of China (2003CB114204, 2006CB101902), National Key Science Plan (2004BA901A36), the Communal Program Specially for Agriculture Research (nyhyzx07-052), and the National High Technology Research and Development Program of China (863 Program) (No. 2006AA02Z180). We are particularly grateful to Dr. H. S. Dong and Dr. C. S. Rothrock, for the critical review and helpful comments on the manuscript. The studies were conceived and planned by JSW. WGM, XBW and ML carried out the molecular genetic studies, participated in the sequence alignment and drafted the manuscript. CFS and YW participated in the sequence alignment, the design of the study, and performed the statistical analysis. DWH carried out the immunoassays. The manuscript was edited and prepared by JSW along with WGM and XBW. All authors read and approved the final manuscript.